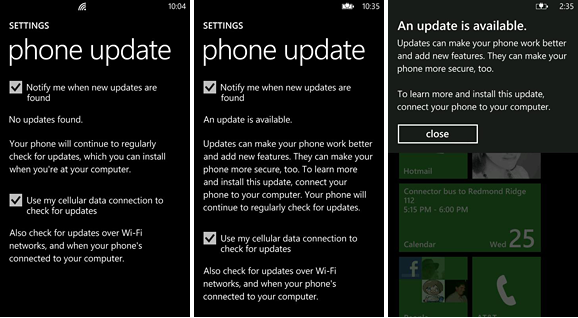 "It's been roughly 48 hours since we hit the send button on our first Windows Phone software update. The rooms around me are buzzing with folks monitoring the rollout, sifting carefully through incoming phone health data (from customers who provide it) and pouring over the anecdotal update reports you've been posting around the web. You've said loud and clear that you want to be kept in the loop. So here's what we've learned so far." It would have been nice to have seen this shared yesterday morning or evening rather than tonight, but Microsoft has finally responded to the issues that have been reported since Monday morning when the update started trickling out across the world. The post explains that, based on the metrics they've collected so far, 90% of updates have gone smoothly - and of the remaining 10%, nearly half of those failed for two basic reasons: a flaky Internet connection or not enough storage space for the computer to do a backup of the phone. It's mind-boggling that someone would be running a computer with less than what I'd guess is the minimum for backups - 20 GB - but in this age of SSDs, anything is possible. The post confirms that the update has been stopped for Samsung phones as they work on a glitch that was impacting some Samsung phones. It also confirms that all Windows Phones are "eligible" for the update and mentions nothing about carriers blocking the update - an error of omission or a clever dodging of the truth? Hard to say. Incredibly, it "could be days - or even weeks" before we're all able to update our phones. Weeks? What kind of "phased roll out" is Microsoft doing here, one based on 56K modems? "...Microsoft and the carriers we've partnered with around the world need time to test phone updates to make sure they meet our joint quality, performance, and reliability standards. Testing schedules can vary, and that affects when you'll be able to download an update." That would seem to imply that rather than us simply waiting for some server somewhere to tell us we can update our phones, some of us are actually waiting for our wireless carriers to test the update before, presumably, telling Microsoft "Yes, you can release this now." I thought that testing happened before the update was released, not after. What bothers me most about this seemingly screwed up this whole process is that, when compared to how the competition such as Apple updates their phones - which are on networks all over the world too - this seems fraught with problems. I really hope Microsoft can learn from what's happening right now and smooth out the rough edges. One thing's for sure: this isn't exactly the update process I was waiting for. That is totally irresponsible on Microsoft’s part! ALL of the data required to complete the upgrade process shall be download to the hosting computer before starting said process. The upgrade procedure shall check for additional storage space required for the backup process before proceeding to the upgrade process. It is common sense Microsoft. What level of CMMI is your company certified too? Don’t you have requirements documents? Or have the monkeys taken over? I'm from Australia and on Telstra with a HTC Mozart and still waiting for my dam update. If the carrier are testing it, then know telstra how they can be. I wont get this update. was looking forwards to it. These update should be tested first once all carrier have tested. Then let mircosoft push it out. Looks like MS will never send and update to this phone!!! ALL of the data required to complete the upgrade process shall be download to the hosting computer before starting said process. The upgrade procedure shall check for additional storage space required for the backup process before proceeding to the upgrade process. I'm not a developer, but I have to agree: checking for sufficient storage space before running the update process would seem to be a mandatory step that you'd want to perform. If insufficient disk space is detected, it should offer to launch the Disk Cleanup program to attempt to recover space. So I broke down and bought a Samsung Focus on the expectation that NoDo was coming out soon. Now this. *Sigh*. Microsoft isn't inspiring a lot of confidence here. However, I love the Focus and am totally enchanted by WP7 as it is. But definitely looking forward to enhancements, assuming they don't break the phone. The Focus is my secondary phone (after my iPhone 4) so I'm more willing to be patient than I would be if it were my primary or only phone. Trying to give MS the benefit of the doubt that they'll get this right, even in spite of this small fiasco. Apple has had their fails as well with the iPhone but folks seem more willing to forgive them their screwups. I'm willing to give MS the same benefit of the doubt. Oh, it will still be coming pretty soon - I think this "test" run is a good thing to iron out the obvious kinks.